Time was ticking. We had to decide. 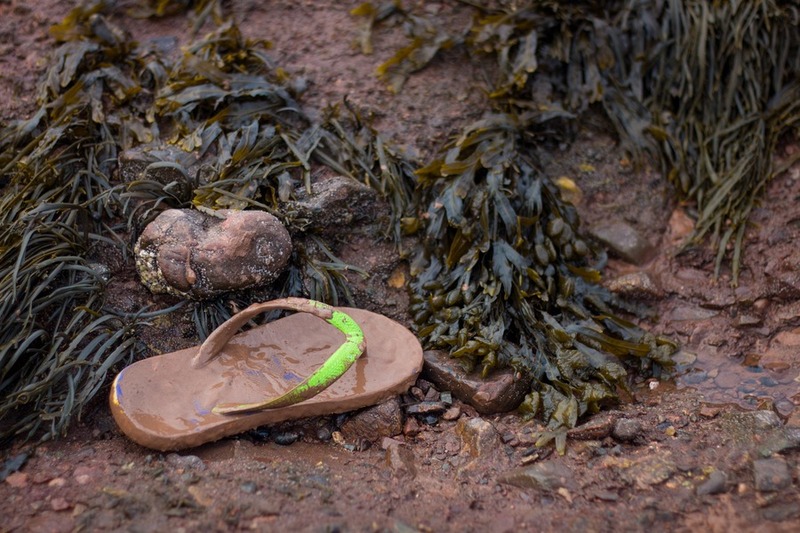 Nova Scotia or Fundy National Park? Seemingly an impossible decision. Our followers on Facebook encouraged us to see Hopewell Rocks during our time in Moncton, New Brunswick. So sorry Nova Scotia, we had our best intentions, but maybe next time. We opted for the world’s highest tides on this memorable day trip. 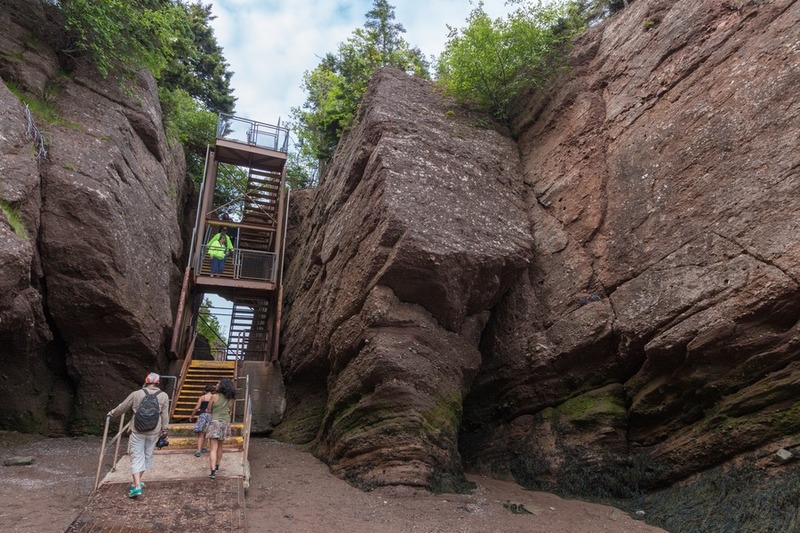 Since we were heading in the direction of Hopewell Rocks we added 2 nearby destinations to the list to make a real day of it. 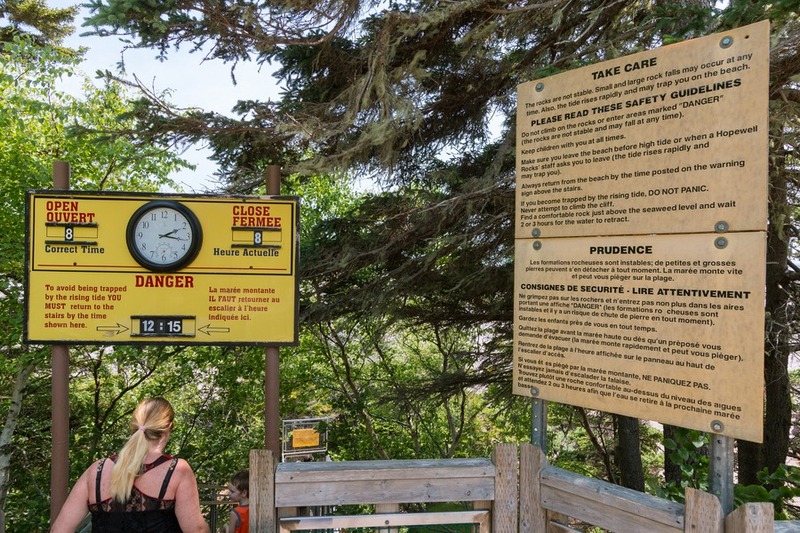 However, it is my recommendation that you do not try to do all these in one day since we wanted to stay so much longer in Fundy National Park and Hopewell Rocks. You could stay overnight in a small B&B and explore the area much more comprehensively. The timing of the tides at Hopewell Rocks varies from day to day, so check the schedule in advance and work your day around it. 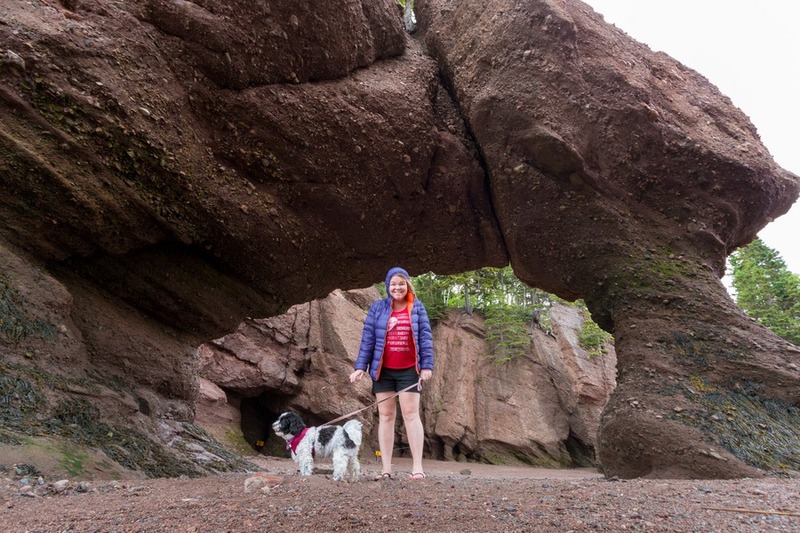 We started the morning by seeing the high tide at Hopewell Rocks followed by Cape Enrage, Fundy National Park, and then returning to Hopewell Rocks in the evening to see low tide. 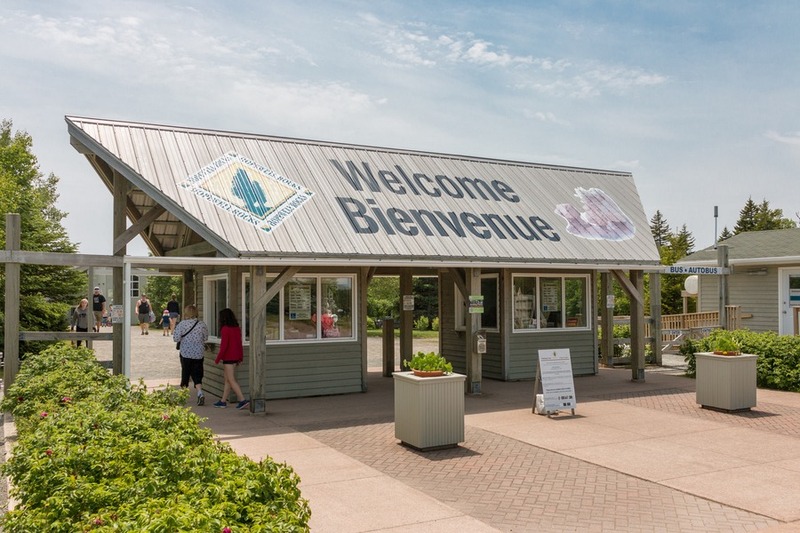 We drove along Highway 114 from Moncton which connects these 3 destinations. 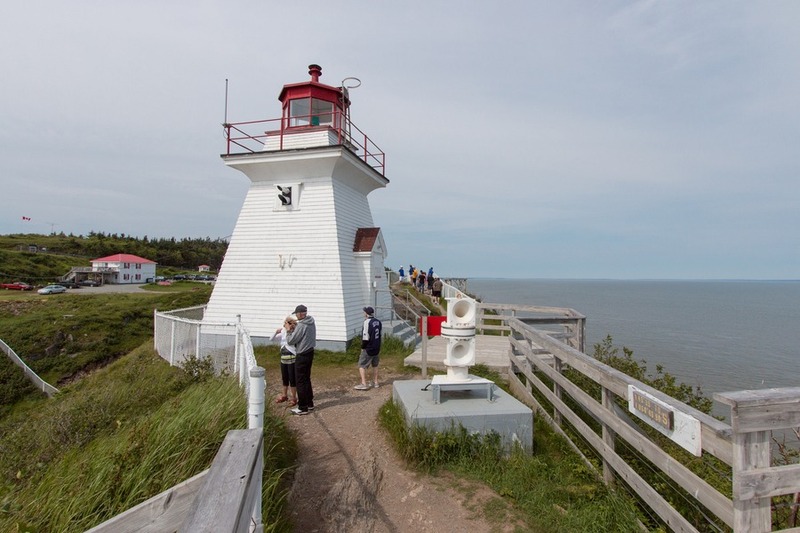 Accessible from Route 915, Cape Enrage is surrounded by jagged sea cliffs that tower more than 50 metres (145 ft). You’ll find a small parking lot with an entry fee and then a gift shop, restaurant and lighthouse over looking the Bay of Fundy. Most visitors come here for the adventure activities on offer: zip lining, rappelling, and rock climbing. These usually have to be booked in advance but if it’s not too busy they may be able to squeeze you in. However the three staff members we talked to couldn’t decide whether our kids were old (and heavy) enough to do it or not. While they continued to disagree and change their minds the other staff member closed the zip line for the day which left our kids deflated by the whole experience. If you time your visit with low tide, you can walk along the rocks on the beach (allow at least 20 minutes or longer for that). We didn’t have time as we were squeezing in a lot into our 1-day road trip. 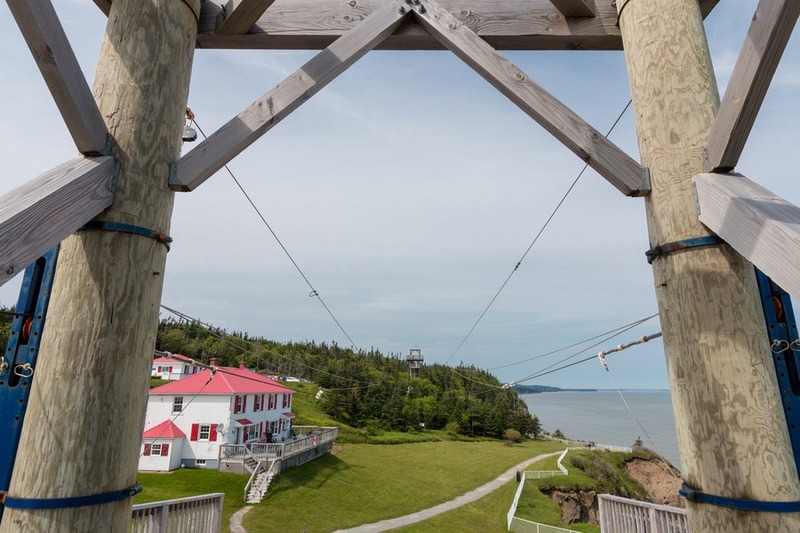 While the views from the old lighthouse were pretty and a friendly guide showed us around, I would only suggest stopping here if you had booked the zip line in advance, and not for the view alone. I wish we had all day for this national park. It was so beautiful. 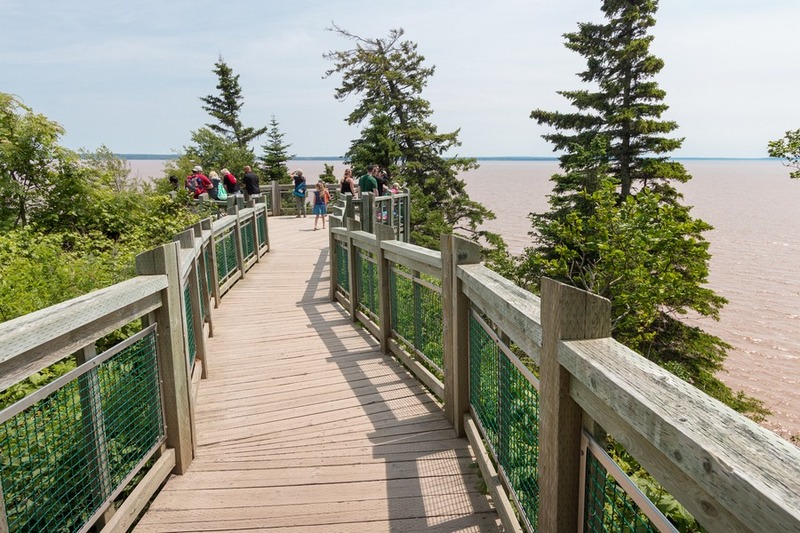 Located along the Bay of Fundy, the park is defined by a rugged coastline and Acadian Highlands. 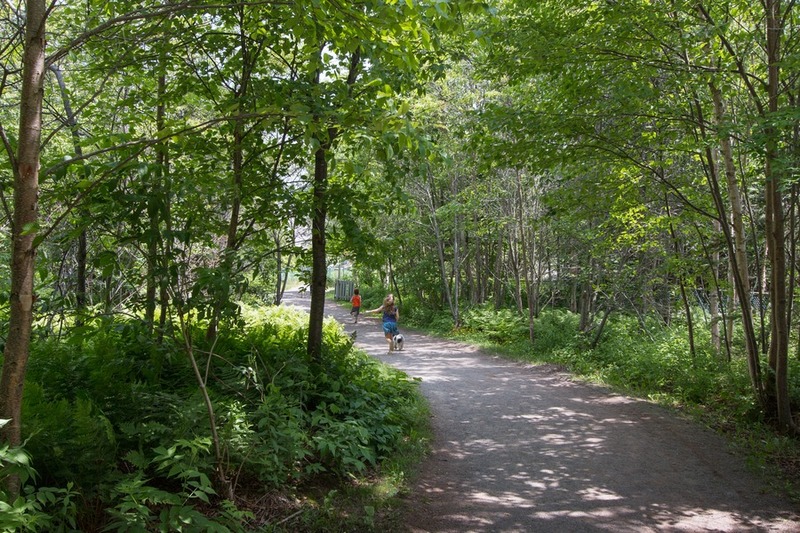 The park covers an area of 207 km2 (80 sq mi) and has 25 hiking trails. Since we didn’t have as much time as we would have liked, we visited the closest (and shortest at 1.5kms) hiking trail to the eastern park entrance, Dickson Falls. A family entry was CA$19.60. The car park near Dickson Falls features outstanding views (so if you just want the view, you could skip Cape Enrage for this) and then we commenced a leisurely walk through the cool woodlands. The path followed the lush picturesque valley beside the swift Dickson Brook. Our dog that we were looking after came with us and the kids had a blast taking him along the trail. Since it was mid-Summer, the water flow was much lower than Winter so the waterfall wasn’t quite as majestic as we hoped for. But we still had a great time anyway. We stopped at a bench beside the bubbling brook so the kids could splash around while we just soaked up the tranquillity of the valley. Naturally entertaining. 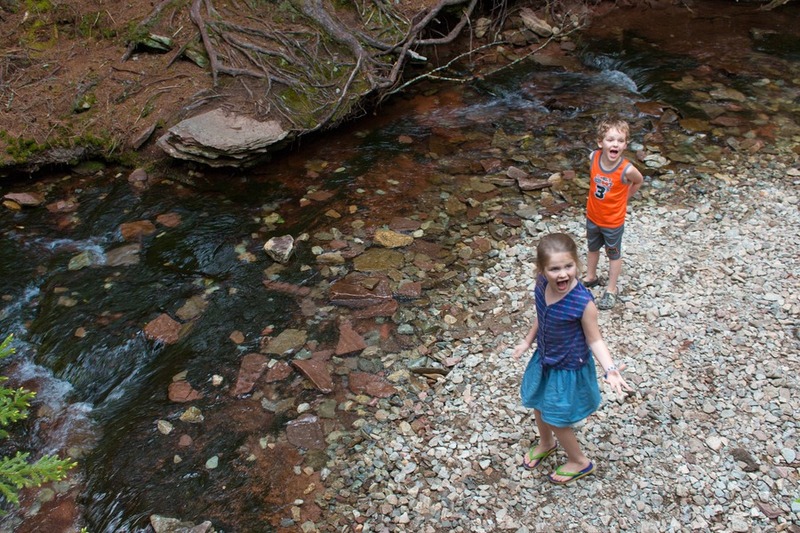 This was an easy hike and I can highly recommend it, even with young kids. We find moments when education flows so easily and today was one of those days since we were visiting the location of the world’s highest tides. The Hopewell Rocks are striking formations caused by tidal erosion along the Bay of Fundy. They stand between 12-21 metres tall (40-70 feet), and due to the tidal cycles they are covered in water twice a day. You can view the schedule online and be present for both tidal changes in one day. We arrived around midday for high tide. The water was really high, kayaks were paddling around and it reminded me of the 12 Apostles we saw in Victoria, Australia. Josh and the kids ventured down the stairs to dip their feet in the cold water while I enjoyed the view. It’s a decent walk down the stairs to the ocean floor so save your energy. We opted to use the CA$2 golf cart back to the park entrance and our car after the kids thought it would be a great idea to have a water fight in the mud-cleaning showers. Later that evening when we returned the water had magically vanished and a muddy chocolate brown ocean floor was visible. We pounded down the steps and gingerly stepped out onto the rocks layered in puddles and icky sticky mud. It wasn’t long before Mia was all in - hands and feet, while Caius cautiously watched from the sidelines. It was getting late, but I found it hard to drag the kids away from such a fun, muddy (and educational) experience. It’s not very often you get to walk the bottom of the ocean. Finally we scaled the stairs back to the top, washed as much mud off as we could and returned home from our fun and very enlightening day. A restaurant pit stop for dinner was out of the question since by this point our kids were naked and exhausted. So we were thankful to find a roadside drive-thru on our way back to Moncton. 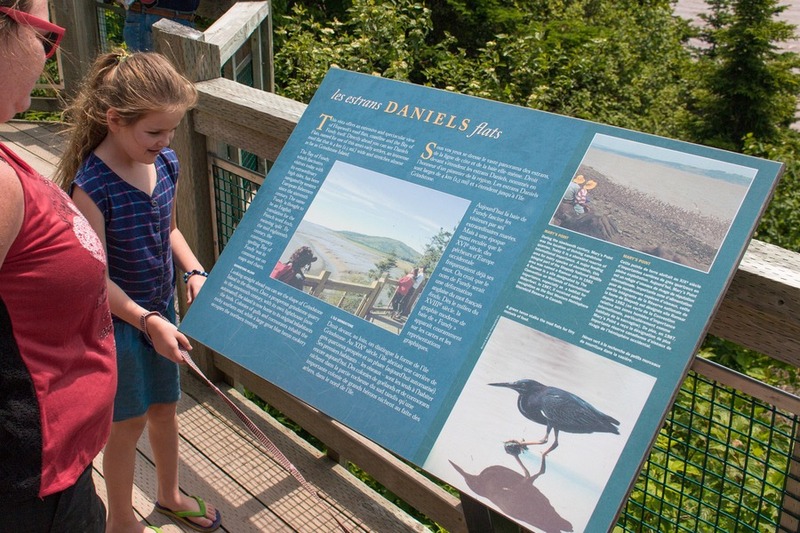 Your entrance fee for the Hopewell Rocks is valid for 2 consecutive days. This means you can return at any time during that period in order to see both the high and low tides. I recommend seeing the high tide first and coming back to explore the low tide. It’s a magnificent difference and the kids will probably get dirtier on the second visit. Bring spare clothes and a travel towel. 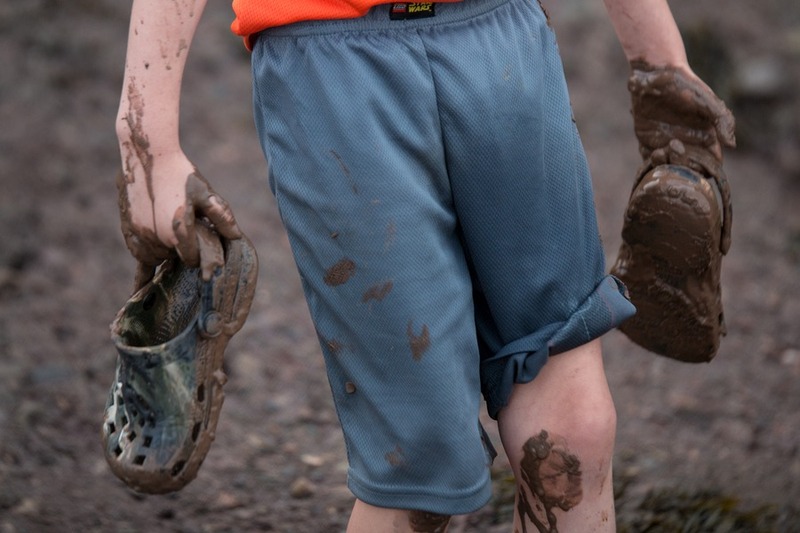 The kids will get dirty and mud will end up in all sorts of unexpected places. If you have little ones keep a couple of $2 coins handy for the golf cart drive back to the entrance. 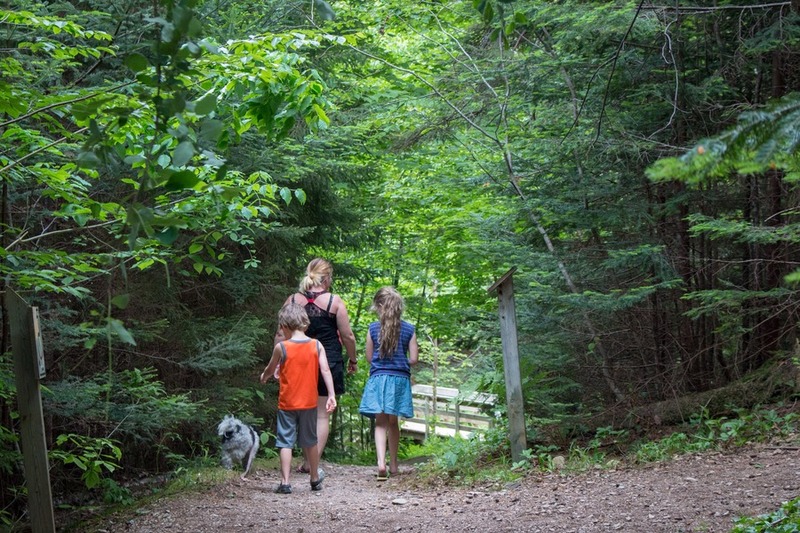 It’s a nice walk down, but if the little ones are exhausted from playing in mud, making them walk over 850 metres up an incline will be challenging. New Brunswick’s Fundy coast is a gorgeous backdrop for a road trip that will get you into the great outdoors. 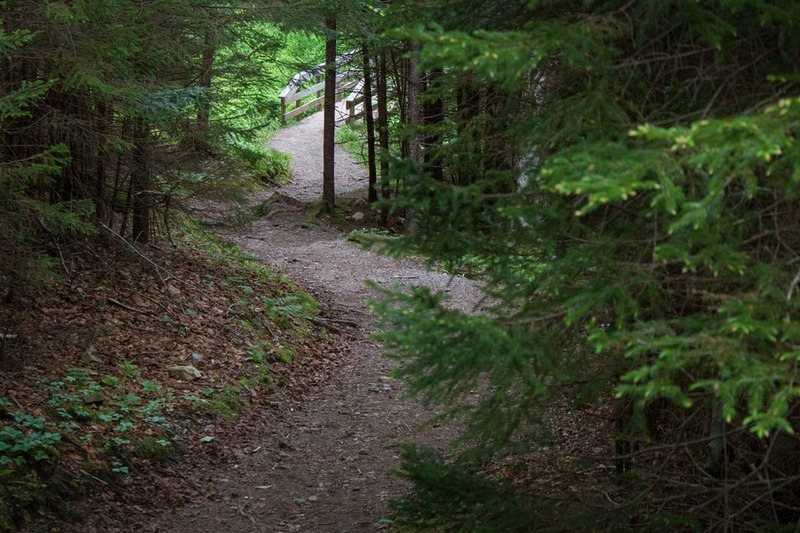 If you’re after something simple, then Fundy National Park offers 29 hiking trails ranging from easy to difficult. 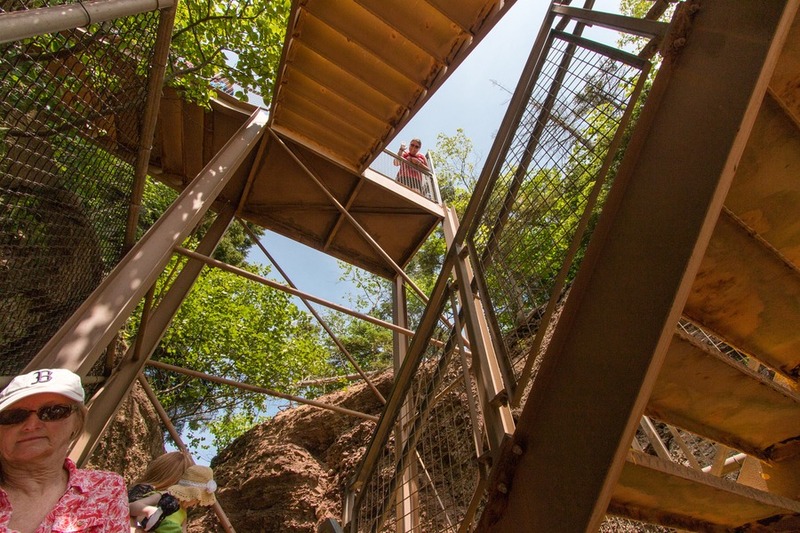 Or for the adventurous, Cape Enrage is your pit stop. But our highlight would have to be the Flowerpot Rocks at Hopewell Rocks. There’s a reason that this landmark attraction has earned hundreds of positive reviews on TripAdvisor – it really is impressive. 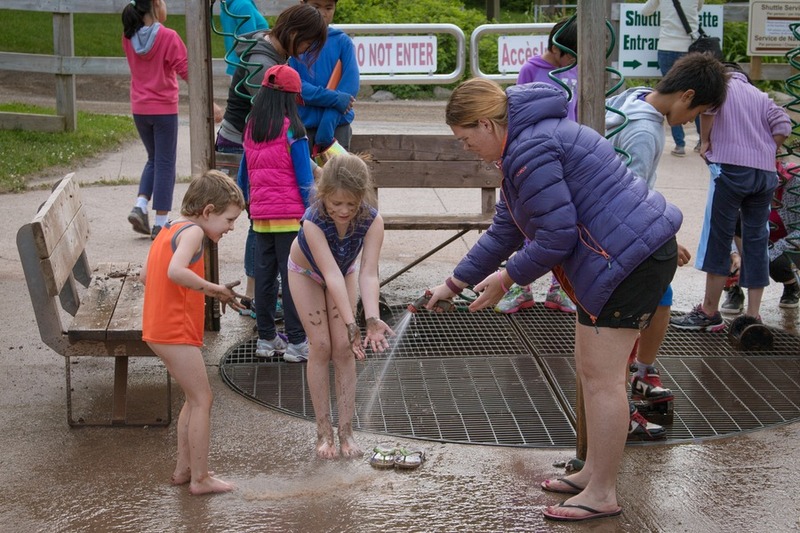 But more importantly, kids can have oodles of fun getting muddy and learning something new at the same time. I wish all educational experiences could be this fun… and muddy. I love that you show the high tide shots! i haven't come across those before! everyone seems to shoot the low tide! i can't believe how muddy the water was, i didn't expect that! one of these days i will get over to the east coast and explore!! But for now, we are off to Victoria! What a wonderful place to take the children (and adults) for a holiday, so much to see and do outdoors. Children will find it such an adventure as is evident here on the children's faces. Good one! THANK YOU for such a detailed explanation. No one had explained to us how muddy it would be, just how cold. Now I will be much better prepared!